In the spring of 2008, Forrest Church wrote what he believed would be his final work, Love & Death. But when an experimental cancer treatment gave him a temporary new lease on life, Church saw he had a chance to tie up the one loose end in his remarkable oeuvre: his vocation as a liberal theologian. The Cathedral of the World offers the culmination of a lifetime of thought and lived theology from one who has been called the leading universalist philosopher of his generation. 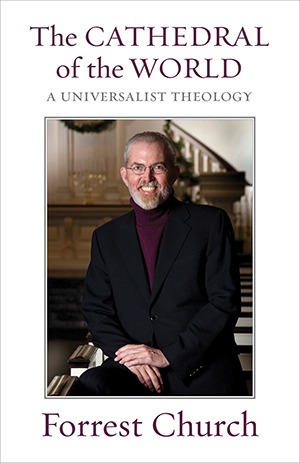 Here Church draws from the entire span of his life’s work to hammer out a clear statement of his universalist theology, gathering his thoughts on religion, faith, and God in a single volume and definitively framing his theological teachings. After opening with a liberal interpretation of the divine, Church compellingly argues that our country was founded on universalist principles, laying out a firm grounding for his theology. Providing a taste of universalism in action, Church’s faith next becomes the inspiration and support for a lifetime of community activism and social justice. Bringing the arc to an end is a systematic unpacking of Church’s theology-the universalist good news that beats near the heart of almost every faith tradition. In a society in which religion has been hijacked by the religious right and ridiculed by the secular left, Forrest Church gives new voice to the power of liberal religion, openhearted and open-minded, humble and awestruck. In answer to the divisive global trend toward competing fundamentalisms and the dangerous spread of neighborly hate, Church invites all seekers to enter the Cathedral of the World, where there are many windows but only one light. "An acclaimed minister's erudite and perhaps final treatise against theological parochialism . . . this book is an essential read for anyone interested in liberal religion."